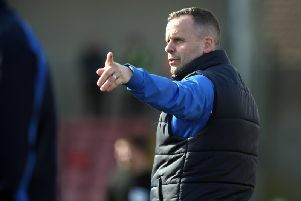 Warrenpoint Town boss Stephen McDonnell hailed his players after their game plan worked perfectly at Ballymena United on Saturday. The Milltown side fought back from a goal down to run out 3-1 winners and pick up vital points in the race for survival at the foot of the table. “I am delighted,” said McDonnell. “We had a game plan and we are trying to bring in our own system and players. “We changed things and the lads have taken a lot of information on board over the last two weeks so I am delighted to get the win. “It is also good to see the work we have put in during training working in a match situation. “We have worked hard on things and the lads did well today. “Sean Mackle did very well and I think that is the best I have seen him play for the club, he has led us very well and he took the responsibilty on as a senior player to take the penalty and he got the job done.